As a blogger, I thought I really understood social media and knew the potential for using it for doing good things in the world, but it wasn’t until I became the focus of a social media campaign myself that I felt the true power of it. On January 15th, I took a big fall, which put me flat on my back, unable to work, with medical bills piling up because of it. For the first week, I stayed positive about it all, determined not to get beat at the mental game while I healed, but after that, I started to really get down on myself. Not only was I going to miss out on climbing, biking, and playing soccer, but I was also unable to keep up with work, which meant missed income, and I couldn’t participate as usual with the family. To which I respond – I got nothin’. Another friend, Adam, calls me up and says, “Hey, David, Jerry, and I want to do something to help you out with your medical bills, and we wanted to know if we should just pass the hat quietly, or if we can post about it online and make a social media event out of it. Would you mind if we promoted it publicly?” Since I’m pretty public with my life, I don’t mind it being promoted, I told him – in fact, I’d be flattered that they took the time and energy to do so. When I woke up on February 1st, I saw the fundraiser posted at The Good Human and Twilight Earth , and started watching the tweets fly about it. It was quite amazing – the links were getting retweeted all over the place, from friends of mine with few followers, to accounts with huge amounts of followers, like Twilight Earth, Elephant Journal, Planet Green, and Treehugger. The potential reach of those tweets was enormous, exposing me and my situation to thousands and thousands of people who have no idea who I am. And then some other green bloggers joined in, with posts going up at Elephant Journal, MNN, The Fun Times Guide to Green, and A Little Greener Every Day, along with a huge amount of tweeting and sharing via Facebook. The outpouring of support was amazing, with people sending me best wishes via direct message and email, which felt great. The fundraiser ran all of that week, and when David, Jerry, and Adam told me that people had donated over $1800.00, I was blown away by the generosity of all of the people who took the time to donate some of their hard earned money to a guy they had never even met! While I do have more bills than this amount will cover, it doesn’t matter – the fact that people would be willing to donate to my situation at all is incredible, and it’s not just me that benefits from it, as this also greatly affects my family as well. So it’s a huge gesture toward my whole family, and one that I don’t take lightly. I’ve never met Adam, Jerry, David, Shea, Robin, or Jeffrey before (the only one I’ve actually met is Waylon Lewis), yet they blogged about it and helped promote this fundraiser. I’ve only interacted with them online, via Twitter, Facebook, their own websites, as well as talking or chatting with them on Skype. So they are part of my community, except it’s a virtual community, a digital village, not a local community. And they came through for me and made me really feel the connection and reap the benefits of it. That’s amazing to me. I just need to say, from the bottom of my heart, a huge thank you to every single person who helped with this social media campaign, whether through donating or just spreading the word. It’s been a testament to the power and reach of social media, and I feel honored to have such a great virtual community that would be willing to ‘get my back’ when I am in need. Derek, I’m so glad that I was able to participate and help a little with your recovery. After all, that’s what friends are for. Right? What kind of community would we be in if we could not help each other? Get well soon, and don’t go falling off any more rock faces! Agreed, Alison. Community is about taking care of all of our needs, not just for fun. We just feel lucky to know you! Glad you’ll be ok! Thanks, Danielle! I appreciate all you do as well! Great post; really heartwarming and I’m so pleased your online community of friends were able to reach out and help you. .-= Mrs Green @ my zero waste´s last blog ..Making convenience food without the waste =-. Thanks! It’s been a big lesson for me, and I thank you for being a part of my virtual community! Great post about something I’ve been thinking about for a while now. Most of the people I connect with I’ve never met and yet I’m struck by the support structure that is evolving around me. 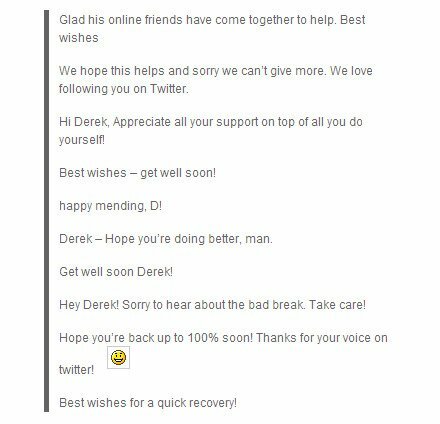 Heal soon – love reading your stuff, Derek. .-= wildelycreative´s last blog ..A bit more of me… =-. Derek, This is a great story thanks for sharing. Based on the Law of Attraction and the Law of reciprocity, It’s clear you have good energy and have attracted & earned good relationships. In my opinion as we head towards a greater world consciouness I think we will see more of this “real” (virtual) connection. I believe we all have an internal guidence system, that when tapped into we know who is good, kind, well meaning or well deserving. Stay positive and pressing forward. .-= Dallas M Cyr´s last blog ..Belief & Feeling =-. SO happy for you, D! Well deserved. You make all of our lives richer with your words and kindness. Thank you, Bethe – you’re also making our world richer every day! Thank you, Nathan. Someday I’d love to meet all of you face to face and have a cold one together! How awesome that must have been to be on the receiving end of this. What a way to restore your faith in humanity, eh? Glad I could play my small part in that. And I’m glad you’re back in the game. It’s funny, what you wrote about having not met most of the people who coordinated this. I have to chuckle at times, all these people I know in far flung places, who I’ve laughed with, connected with, fought with…and we’ve never spoken. Crazy, interesting world(s) we live in! .-= Paul Smith´s last blog ..The 3 Best Ways to Drastically Reduce your iPhone (Or Any Phone) Bill =-. I missed this whole story – but Derek… you gotta know, you are such a giver yourself it’s bound to come back around. We are very lucky to have you around, vertical or horizontal. When my Dad was dying this year, I was amazed at all the love surrounding me coming from people I had not actually met.